C1657. GABRIEL PIERNE Cond. 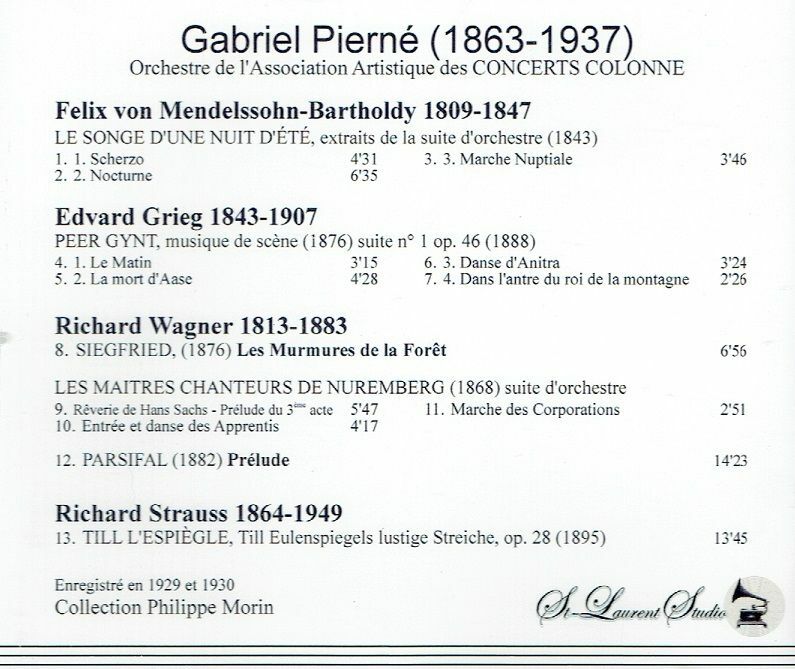 Concerts Colonne Orch. : Mendelssohn, Grieg, Strauss & Wagner. [Breathtaking transfers of these glorious performances! Highly recommended!] (Canada) St Laurent Studio YSL 78-758, recorded 1929-30. Transfers by Yves St Laurent. “What madness, what deluge, what irrepressible rhythmic vitality that nothing can restrain. It is also the sign of the art of Pierné the conductor; he plays modern, straight, bright, and it’s TILL EULENSPIEGEL, an unaltered model remarkably captured for the time by the engineers of Odéon and faithfully engineered by Yves St-Laurent from copies in perfect condition on loan by Philippe Morin. This is the highlight of the second volume of this Pierné edition dedicated to German repertoire, also including the First Suite of PEER GYNT. Wagner is illuminated by the French spirit, as did Cortot in the 1920s. Yet, Pierné reaches to an extra dimension in the PARSIFAL Prelude, bright but filled with questions, the initial motive becoming a fascinating unanswered question. The first volume illustrates Pierné's affection for the Russian repertoire: impossible not to be blown away by the coda of his Spanish Capriccio or by the PETROUCHKA Suite. 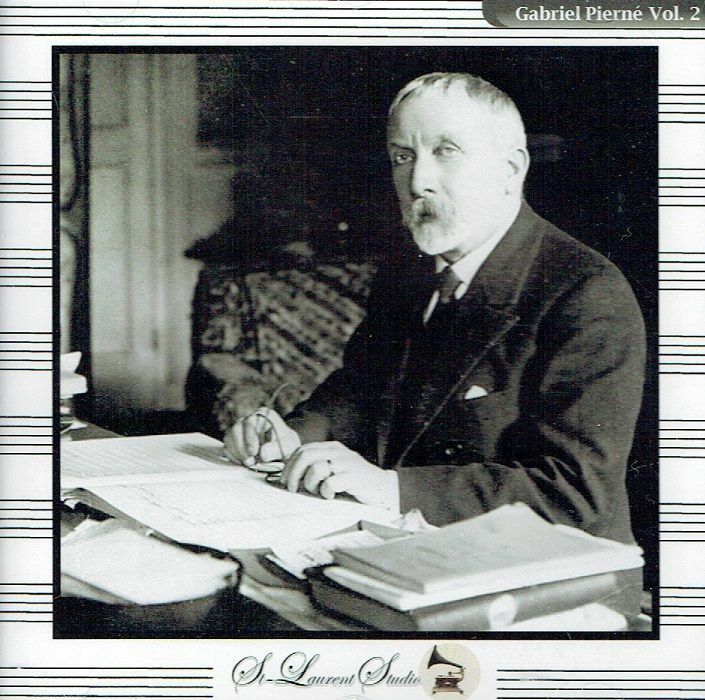 “Gabriel Pierné has been called the most complete French musician of the late Romantic/early Twentieth Century era. 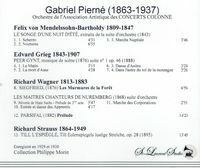 In his own music Pierné blended a seriousness of purpose (acquired in part through his studies with Cesar Franck) with a lighter, more popular flavor reminiscent of Jules Massenet (with whom Pierné also studied); his dedication to the music of his contemporary French composers earned him a reputation as a conductor of deep integrity….by 1871 he had entered the Paris Conservatoire to study composition with Massenet and organ with Franck (Franck's organ class, however, often focusing more on composing than on playing). At age 11 Pierné earned a medal for his solfège skills, and he later went on to win top prizes in organ, composition, and piano, as well as (in 1882) the coveted Prix de Rome (for the cantata EDITH).